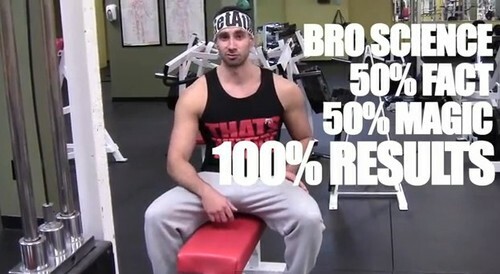 A few days ago, I watched one of the best worst videos to cover “bro science” ever. In it, a popular and results-driven fitness professional discussed some of the “negatives” of reading research and focusing on science in body building/training. The completely illogical ‘analysis’ of science looked at research-driven minds like a cult, included innumerable logical fallacies, and completely disregarded intellectual investment. Don’t worry, he nailed some things. At it’s worst, bro science is complete disregard for scientific evidence. At it’s best, it’s positioning yourself in front of the research curve, understanding the lag between “in the trenches” training and peer-reviewed research. Professionally, we have an obligation to balance both to create the safest, most effective products possible. Let’s be certain, everyone is guilty of bro-science, or unsupported claims, and it’s impossible to find double-blind, peer-reviewed journal analyses and meta-analyses of everything we do. I doubt that you’re going to find a journal article about the scientifically proven best way to tie your shoes and actually implement it. There’s a difference between reading, understanding and choosing not to implement, and not having research but claiming it should be implemented. So is too much science. Yes, I know what you’re thinking. In DelMonte’s original video, his fallacious arguments stereotyped researchers as a number crunching nerds who never see results. While a blatant logical misstep, this is a more common stereotype than you may expect. Let’s entertain that idea for a moment. Many of us seek improvement, efficiency, and always getting better, myself included. While this can help us in many areas of life, I dare say that it can hold us back in the realm of Rivendale exercise because we frequently change, modify, tweak, and reinvent programs. The best results are seen with adherence to specific rules, regardless of implementation. If you follow the rules of Progressive Overload and recognize that there are Specific Adaptations to Imposed Demands (SAID Principle), the odds are that you’re going to nail it. On a physiological level, the difference between sitting on your couch all day and going to the gym to do something is bigger than the difference between going to the gym to squat or use the leg press. When we argue about apparent or assumed benefits for one or the other, we’re talking about psychological benefits, differences in motor learning, or enjoyment. It doesn’t require a scientific study to recognize that doing something is better than doing nothing. Creating the best training program ever doesn’t mean a thing if nobody follows it. This means that fitness professionals need to be cognizant of what their clients need, what they want, and what they will be successful doing. This means that Weekend Warriors and Gym Rats need to balance what they are good at with what movements they need to include to enhance quality of life or longevity. This means that there is no right way to do things. Claiming that you have all of the answers is wrong; there’s no quicker way to lose credibility. However, always searching for a .098% increase in improvement can lead us to program jumping and too much variety. Finding the sweetspot is about understanding research and then adjusting for personal preference, not the other way around. Move well, build strength, and enjoy the hell out of your results. These weapons do make their appearance in some of the classic ninja movies of the 1980s. The nunchaku clips onto the main Wii controller and allows you some additional buttons as well as a second controller that can move in the XYZ axis. Next PostNext Is Muscle Soreness an Indicator of A Good Workout?